This morning, we went into Reno to the Peppermill for Saturday Brunch. We were early enough that it wasn't crowded. (The pre-Kentucky Derby crowd was showing up as we were leaving.) Normally I mark a keno ticket for five games, but with the restaurant not crowded and us not being in any hurry, I marked a different ticket than my usual one. It was a 4/20 at 50 cents per way. Here's what the computer-generated ticket looked like. What it means is that I was betting 50 cents on four separate tickets, each marked A, B, C, and D in this case. Each was a separate 50 cent bet betting on those twenty numbers. In keno, they draw 20 balls out of 80. Your win is based on how many numbers you "catch." If you catch 16 or more, the payoff is 50,000:1, or $25,000 in our case. Our keno runner (who was also an assistant keno supervisor) told us that as far as he knows, nobody has ever hit the 16+/20 ticket since the Peppermill opened (and he's worked there for a long time), nor has anyone ever hit a 15/15 ticket, which pays even more, although he says someone did once hit a 14/15, which pays very well indeed. The only things that do not pay on a 20-spot ticket is 4, 5, 6, or 7 numbers. Those are, of course, the most common results, given that the most likely outcome on any given game is that you'll get five numbers in each of the four quadrants of the ticket. Normally you have to pay $2/game to mark a 20-spot ticket, but the Peppermill allows you to play a ticket for as little as 50 cents per "way" if you play at least ten games, as I did here. I normally don't play a ten-game ticket because it takes so long to play (the normal pace of play is about seven games per hour), but we were going to take our time over brunch today. We settled in to the brunch buffet. 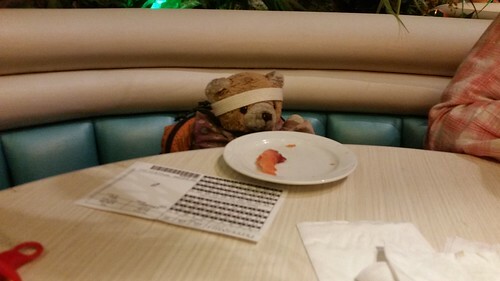 I gave my ticket to travelswithkuma to guard, along with some nice smoked salmon and an admonition to Kuma to make all of the balls go to one corner. After leaving Kuma with his plate of salmon, I went up to get my own meal. 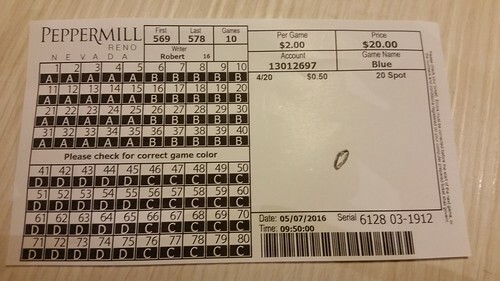 The first three games had seen some small wins including catching 9/20, which pays $5 on a 50-cent ticket. I had some hope that the $20 ticket would at least pay for itself. I couldn't see the keno boards from within the buffet line, but when I came back to our table, I looked up and saw the next game that had been drawn while I was getting my food. I wish I'd taken a picture of the board, because it was a very lucky board. No numbers had landed in the lower-right corner — board C on my ticket. I know that's a good thing, and looked up the pay table: on a 50-cent bet, 0/20 pays $100! That's the biggest keno ticket I've ever hit in my life. (My grandmother once apparently caught a $400 (worth about $2500 today) many years ago, but the most I'd ever hit was around $40.) The keno runner gave me a big thumbs-up as he went by. And we still had six games to play! In the end, our $20, ten-game, 4/20 ticket paid $118. I tipped our runner $8. Our winning ticket had paid for itself, for brunch including tips, and for the groceries we bought after breakfast before going home. That was a very good day at the races.